The word "unbelief" occurs 48 times in the Book of Mormon, with 23 of those instances occurring in the same verse with a form of the word "dwindle." To degenerate; to sink; to fall away. This is a pretty good explanation of what most often happens to truth when God sends it into this fallen world where it is not welcome. A frontal assault is so difficult when you're dealing with committed believers. Instead, Satan encourages a small change here, a simplification there, a self-serving narrative to explain what is otherwise uncomfortable. Giving a little authority here, creating a worthiness requirement there, changing a definition to match what you think you know. And soon, you have a religion with no saving power. Notice that as soon as pride crept in, as soon as greed destroyed the practice of keeping all things in common, the first thing people wanted was religion. They wanted someone in authority to tell them all was well, and this is how things should be. Of course, they knew something was wrong, but they quickly built up churches to tell them otherwise. Nobody likes a guilty conscience. It didn't take long to have a wide variety of false churches, all claiming to be Christ's, but all denying the more parts of his gospel. Of course, we wouldn't be so foolish. Would we? Fortunately, Moroni gave us some very clear instructions to guide us and help us gauge whether we dwindle in unbelief. Of course we've built up churches to tell us all is well. We make excuses for the lack of miracles by preaching messages about God's will and having faith enough to NOT receive a miracle. But Moroni begs to differ. In this Telestial world, entropy is the rule. Nothing stays static. Either we are growing in light, truth and understanding, or we are dwindling in unbelief. There is no middle ground. And so we must ask ourselves: What did Joseph Smith teach? Are we teaching it? Are we learning and teaching even greater things, evidencing our growth in light and truth? Are we closer to Zion now than we were 184 years ago? Or have we degenerated, sunk, or fallen away since the days of Joseph? Now, we certainly do have religion, and that in spades. We have rules and laws, duties and expectations, lists to check off, and things to do. We have meetings. Lots of meetings. We have handy ways to judge one another and control one another, even to the point of claiming we can damn one another by our authority and keys. Remember, the people who murdered the Son of God were some of the most religious people on earth as well. They had the temple, priesthood, past prophets, scriptures, rules, laws, worthiness requirements, and leaders in authority who "couldn't lead them astray." It was these very leaders, whose authority was threatened by Christ, that eventually decided to have him killed. If you currently believe we CANNOT be led astray, and we CANNOT dwindle in unbelief because we have God's unqualified promise that these things will NEVER happen to us, please ask yourself where you got that belief. Who taught it to you? Can you find it in scripture? Does this bother you? Just had a discussion in my office today with a woman who is reading Denver Snuffer's book, The Second Comforter, Conversing With the Lord Through theVail. She was asking good questions, all the while her husband was throwing quips about handcuffing her to him so she "wouldn't run off to join some polygamist group". The antidote is the Enos approach, go out in the forest and call upon GOD all the day long and into the night...Come Unto Christ. good post. JR, I agree with you as well. I've heard people say that personal revelation can't be trusted because, after all, look at all the people in the world who have had impressions to join other churches or to do things that are not in agreement with the LDS church. I've heard them say it's better to trust our leaders and to follow the prophet because he can't lead us astray, but personal revelation can. I heard this in a priesthood meeting. I even remember some past president saying something along the lines of being wary of personal revelation since satan can appear as an angel which requires us to be able to discern. Basically he was saying if we have to rely on discernment we could be led astray and so he does not seek such experiences. I can't remember who this was off hand, but you probably know. Pretty crazy how far we have dwindled!!! Because God will only speak to our leaders, not to us. If we seek revelation Satan will come fool us. Just like it says in James 1:5, and Moroni 10:5. This is the VERY idea that damned the Children of Israel and caused them to lose the higher priesthood. D&C 84:25. By the way, JR, the book you mention absolutely changed my life. 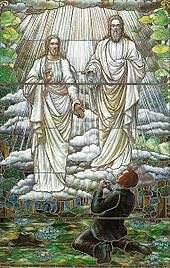 It is interesting that Joseph Smith included information regarding how to distinguish the difference between physically resurrected angels, the spirits of just men not yet resurrected, and the devil appearing as an angel of light. Why would he include such information if we were never to have such experiences? Why would he include it in D&C if no one was ever going to experience the "ministering of angels"? What do you think is meant by D&C 84:73? (Prophecy given through Joseph Smith, so I assume you believe it's true.) Why would the Lord not want his servants to talk about miracles? There are miracles testified about all over in the Scriptures. Also, could you please provide a reference in regards to the TWO member godhead to which you referred? Do you have personal experience with witnessing miracles since you have developed this new faith? The commandment is to not boast or speak before the world. I'd take that to mean just what it says. Never boasting of these miracles, as they are given for our profit and salvation, not self-aggrandizement. As for "before the world" I take that to mean indiscriminately publicizing these things, in an attempt to seek attention. That said, I believe there are appropriate times and places to share such experiences, and they should NOT be taboo to speak about with fellow believers. I do have personal experiences with witnessing miracles. I do not feel it appropriate to publish them here. Question 4: How do you prove that there are two personages in the Godhead? But later in the same reference, Lectures on Faith 5:2, it speaks of the Holy Spirit and says, "and these THREE constitute the Godhead." Two personages + one spirit = 3 MEMBERS of the Godhead. Great catch. I should have worded it "Personages of the Godhead." I'll correct that. Elsewhere in Lecture 5, the Holy Spirit is explicitly defined as the "Mind of the Father." The Father and the Son share this same Mind. Though there's far too much to go into here, the point I'm making is that we've built a tradition that there are three independent personages in the Godhead, when there are not. We've made the Holy Spirit into a personage, conflated the Holy Spirit with the Holy Ghost, and thus redefined the Godhead based on trinitarian influence. Therefore, if we want to have saving faith, we need to un-learn some ideas we have about the Godhead, and learn correct information about God's character, perfections and attributes. So are you saying that you have also found evidence that the Holy Spirit is different than the Holy Ghost? The Father has a body of flesh and bones as tangible as man’s; the Son also; but the Holy Ghost has not a body of flesh and bones, but is a personage of Spirit. Were it not so, the Holy Ghost could not dwell in us. A man may receive the Holy Ghost, and it may descend upon him and not tarry with him. On the other hand, if Joseph Smith--who stood in the presence of the Father and Son--knew what he was talking about, then there's more to the story and it's worth searching into. I believe Joseph knew what he was talking about. So, you're saying that the Holy Spirit is the mind of God and the Holy Ghost is a separate personage that does not have a body. Correct? Yes. But as I mentioned before, there is far too much to go into here. We simply won't capture the breadth of information in a soundbite. So the statement you propose is correct enough, but is only a sliver of the complete picture. I'm really not trying to be obtuse. I just hesitate to take on what requires lengthy and careful explanation in this limited venue. The point to be made here is that Joseph Smith taught something different than what we now teach. That's a problem. 1 Ne 11:11 "And I said unto him: To know the interpretation thereof—for I spake unto him as a man speaketh; for I beheld that he was in the form of a man; yet nevertheless, I knew that it was the Spirit of the Lord; and he spake unto me as a man speaketh with another." Is this the Spirit of the Lord, or the mind of the Lord to which Joseph Smith was referring in the Lectures on Faith? Because that sounds like a personage to me. Are you sure that Joseph Smith was not just inconsistent in his terminology? Why did he publish the first Article of Faith, "We believe in God, the eternal father, and in His son, Jesus Christ, and in the Holy Ghost"? Was he not talking about the godhead here? In this scripture, it refers to the Spirit of the Lord, which is, literally, Jesus Christ appearing in his spirit body and speaking with Nephi. Christ opens the vision to him, then as the vision continues, an angel is his guide as he sees the life, ministry and death of the Lord. OK, I concur on that point. I actually had that thought just after I published this comment. What about the 1st Article of Faith? Do you think further revelation taught him that the Holy Ghost is a member of the Godhead, or is it not referring to the Godhead? I don't believe further revelation corrected Joseph's lack of understanding. I think his understanding was correct all along. The statement of belief in the first article of faith is entirely accurate. We do believe in those three. The matter at question is whether those three form the "Godhead." The Lectures on Faith make it clear they don't. This is an example of how trinitarian doctrine crept in and led us to believe the Godhead is made of three persons when it is not. We teach that as doctrine, though Joseph taught something different. To make matters worse, current commentators believe, as you said, that perhaps Joseph, who stood in the presence of God and Christ, was merely misinformed, and now we know better. By the way, you said, "I had that thought just after I published this comment." THAT was the Lord speaking to you by means of the Holy Ghost. Take a look at Moses 6:61 and ponder the words there. Matt 3:16 "And Jesus, when he was baptized, went up straightway out of the water: and, lo, the heavens were opened unto him, and he saw the Spirit of God descending like a dove, and lighting upon him:"
Nephi calls it the Holy Ghost, instead of the Spirit of God. The Scriptures aren't even consistent in their terminology about the Holy Ghost, and yet you expect everything Joseph Smith wrote to be perfectly clear or you say we're being taught incorrectly today. You are correct: The scriptures do have some inconsistency in this area, which makes it more difficult to sort out. You invited people to present evidence against what you're saying here, but when I do, you claim it's too broad of a topic. Hey, you brought it up first. Have you ever heard the parable of the blind men and the elephant? You probably have. In it, there are four blind men led to an elephant to discover its properties. The first feels its trunk and exclaims, "An elephant is very much like a snake!" The second feels the tail and says, "An elephant is like a rope!" The third feels a leg and says says, "No, an elephant is like a tree." And the fourth exclaims, while feeling the side of the elephant, "You are all wrong! An elephant is like a wall!" The point I'm making is that we wander about like these blind men, feeling bits and pieces of the whole, then thinking we understand it all. This is not a criticism by any means. Merely recognition that we're trying to comprehend a topic that is much larger than what we hold in our hands. I'm really, honestly gratified that you're looking into this topic. It is SO important to do so. But it's also important to realize that what you're holding in your hand may only be the tail. There is much, much more to discover. To understand the Holy Ghost is to possess one of the great mysteries of godliness. The Lord wants us to seek these things out. He WANTS to reveal these things to us. I stated that Joseph Smith taught the Godhead consists of two personages. And he did. You've read the quotes. Rather than seeking evidence to contradict WHAT Joseph taught, why not seek to understand WHY he taught it? As for being too broad of a topic, there simply is not room here to contain the whole elephant, nor would it be wise to try. If your intent is simply to prove me wrong, you're really trying to prove Joseph wrong. I'm only stating that he taught it. If your intent is to actually understand the Holy Ghost, a better approach might be to forget what you think you know about the topic and seek to find out what those who have met the Lord know about the topic. Since you and I know each other (I believe) I would be glad to discuss these things with you in a setting where it would be more appropriate to teach them, if you're interested, and if understanding is your intent. Either way, I do sincerely appreciate your questions! Clearly you care about this topic. Thank you for taking the time to consider these things. The gospel is far more beautiful, amazing, and joyful than I ever thought possible! I'm not trying to prove Joseph Smith wrong. I'm just not sure that there is actually a contradiction there as you say there is. I am seeking to understand, through study and prayer. I actually ran across these verses because I recently started over reading the Book of Mormon personally from the beginning, trying to gain further understanding about the Holy Ghost, prophets, and miracles. And I didn't think you were trying to prove Joseph wrong either. I just wanted to make clear the origin of the doctrine we are discussing. I think its absolutely wonderful you are reading the Book of Mormon and seeking understanding!!! I'm jumping up and down with excitement!! Too often we read just to read, when we should be searching, seeking and most of all, ASKING! The scriptures were given us to be a Urim and Thummim, if you will, designed to cause us to go to the Lord with questions. It's back to James 1:5. Heaven responds to questions! I hope your reading is bringing you much new knowledge, insight, and closeness to the Lord. God bless you in your search! ...possessing the same mind with the Father, which mind is the Holy Spirit that bears record of the Father and the Son. These three are one; or, in other words, these three constitute the great, matchless, governing and supreme power over all things. (Lecture 5, P. 2.)" Ttilby's quote is from this link, dated Aug 19, 2014. http://denversnuffer.com/2014/08/laying-on-hands At the conclusion of that post, Br. Snuffer summarizes, "There is no single denomination and no valid incantation that provides access to the Holy Ghost. No authority can remove it from the honest in heart. Nor is there authority, apart from that given by Christ and the Father (following mighty prayer and supplication) which can confer the blessing as a gift to a recipient. But the commandment to be baptized, when done in faith following repentance, will bring this gift to everyone. This is Christ’s Gospel." As to the quote above where he says "the Holy Ghost is the mind of the Father and the Son," I wonder if that's a misquote? Denver never has not corrected that post so perhaps not. If it stands, then it seems like there is some interchangeability, or we should not get hung up on titles, and look more to the functions of the Holy Spirit or intelligence of God. I'm persuaded that when we are baptized, that that might be an injunction TO BECOME a (the) Holy Ghost, in other words, a sanctified and holy personage of spirit, thus BECOMING "one" with God and Jesus. I wonder what “personage” meant to Joseph Smith as well? Nobody has ever seen THE Holy Ghost. That seems significant to me. Perhaps that's because the kingdom of God is within us and we must seek to be one with the Godhead by becoming a holy spirit (ghost), so that WE may bear witness of the Father and the Son, because isn't that the mission of the Holy Ghost, to bear witness? Hasn't Joseph borne witness of the Father and Son? Hasn't Denver? Haven't all the "holy" prophets? Could these prophets who've received the sure word of prophecy be holy, or “holy ghosts”, and then REQUIRED to bear witness, fulfilling the mission of "the Holy Ghost"? I’m searching for truth on this subject. Interesting find. I'll have to email him about that. Elsewhere, he has taught at length that the Mind of God is the Holy Spirit, in agreement with the Lectures on Faith, and that the Holy Ghost is a personage, in agreement with D&C 130. Perhaps this is a case of ambiguity, as we sometimes see in the scriptures. I'll post here what I find out. I don't think there is contention here at all. Simply someone trying to understand. There are still mighty miracles in the church. I witnessed one 3 weeks ago. I also witnessed revelation this past weekend. Would you please share your thoughts on two topics, please ? 1) Adam-God, as taught by Brigham Young : Does that make sense to you, is that scriptural to you ? 2) The change in priesthood conferral-ordination that took place in 1921. Hi Tiberius. Thanks for reading and caring enough to comment. 1) Adam-God. I'm aware of what Brigham taught, and the subsequent disavowal of the teaching. I don't have an opinion to share yet. There's more to the story than I'm ready to write here, and I still have a lot more to learn. 2) There's also more to the priesthood ordination story. In the end, I don't think the change, or the change back, particularly mattered. I believe the ordinations were recognized. I find it striking though, that such a fundamental change would take place, then be changed back by prophets who apparently had very different understandings of the priesthood. 1) I too believe there's more to it. I've studied quite a bit about it but haven't made up my mind yet. Hoping the Lord will show it to me one day. 2) You said you believe the ordinations were recognized. How come ? I mean, if just the wording were wrong, I'd agree (as the baptismal ceremony has changed for example. 3 Ne 11:25 says "Having authority...", and D&C 20:73 "Having been commissioned.."). But in this case they changed something that seems vital : they stopped conferring the priesthood and started to assign people to an office, just like we do in earthly organizations, right ? Don't you think this procedure was void ? Sorry, I forgot to ask you another thing. 3)Now that we're talking about priesthood, what about the pre-1978 priesthood ban ? Was it indeed a commandment or a product of prejudice, etc ? Scriptures seem to agree with that early policy and no revelation has been shown (only official declaration and we know that is not revelation). Since the ordination language has not been dictated in scripture, and since Moroni 3 actually agrees with the practice of ordaining to an office, and since the church officially recognized the ordinations as valid, I believe the Lord did as well. When the ordinance language is given by revelation, we are not to deviate from it. But when there is no specific language given, I believe the wording used is acceptable for the intent thereof. As for blacks and the priesthood, Joseph Smith ordained men of African descent. That's good enough for me. I believe whoever changed the practice after that so that Africans were prohibited from ordination, did so without revelation. Call it a product of prejudice, social practices of the day, racism, whatever you want. In the end, if it wasn't done at God's word, it doesn't much matter why it was done. Got it, thanks for sharing your point of view on those points. Still, about the priesthood and lineage however, I always understood that if it were not to be bestowed on some specific lineage it would've been explicitly informed in the scriptures. There are some scriptures saying one lineage shouldn't receive the priesthood and thus my question. So you believe priesthood can be bestowed on any worthy man, then ? No matter what Pearl of Great Price says about it ? Which lineage and which priesthood? Does lineage equal race? Does lineage equal family? These questions are not explicitly addressed, so I think it's dangerous for us to start denying ordination based on our interpretations. Additionally, the intermixing of bloodlines throughout the world means it's highly unlikely you'll find a man who has no mixture of lineages and even races. How would you tell? There's no blood test for priesthood. Kind of reminds me of when that white supremacists guy went on TV and was shown by genetic testing he was 14% African. Under Brigham Young, would he be precluded from priesthood under the "one drop of blood" policy? Unless and until God clarifies the issue through explicit revelation, I think it's best to assume we don't know beans and therefore ought to ordain all worthy men. Joseph did. Great, thanks for your reply. I know I'm following an old conversation, but I had a question related to lineage and priesthood, which I haven't taken to the Lord, but I should. In the Book of Abraham chapter 1, we understand that Pharaoh was attempting to "imitate the order established by the fathers in the first days." It also says that Pharaoh was denied the priesthood by his lineage, though they would "fain claim it from Noah, through Ham." My question is, for what reasons would the Lord deny priesthood to an entire lineage in the first place? It seems to me that it would sow the seeds of the modern practice of denying blacks the priesthood, whether the Lord intended that or not, through man's agency. If the Aaronic priesthood is as durable as we are led to believe(as compared to higher forms of priesthood) then wouldn't that be appropriate for people who were attempting to imitate that order of the fathers? It would at the very least provide a connection to the ministry of angels to bring one further. Is that not denying an entire group the opportunity to repent, despite the sins of their fathers? Israel lost Moses, but the Aaronic priesthood persisted. We now say today, we lost Joseph and the Melchizedek priesthood, but the Aaronic priesthood persisted, at least until recently. Thank you for the questions. I'm certainly not qualified to give complete answers, but I'll offer what I can, with the understanding that only the Lord can complete the picture. The idea that Noah cursed Ham as pertaining to the Priesthood is a concept we are not even prepared to comprehend at our current level of understanding. We do not know anything about "the order established by the fathers in the first days." Therefore, we can't even seek to imitate it. So Pharaoh was far ahead of us. What does that say about his "cursing" and ours? We operate under the mistaken assumption that Priesthood is a set of offices that give a man "authority" to do certain things, and too often, to control others or be in charge. Therefore, we assume that the quote about Noah, Ham and the Pharaohs means they were denied the privilege of "holding" this authority. Ignorant churchmen have twisted their lack of understanding into all manner of prejudice and abuse, as is the nature and disposition of almost all men. But until we can understand what priesthood is, in its fullest sense, and comprehend the covenant that is currently not even found on the earth, we cannot begin to have an intelligent discussion about what's going on with Ham and the Pharaohs. We will first have to wrap our heads around sealing authority, dispensation heads, the law of adoption, the right of the Firstborn, the Church of the Firstborn, and something called the Kingdom of God. We may think we know what each of those terms means, but we don't. So, with that said, I'm willing to withhold judgment on what "cursed as pertaining to the priesthood" and "that lineage by which he could not have the right of Priesthood" might mean. As soon as we assume we understand these concepts and leap to our own conclusions, we demonstrate our unbelief and prevent the Lord from teaching us more. We have so very much to learn. We will have a very different understanding of these passages in a time to come. How Can You Tell if You've Got it Right?